Additional resources are being deployed on the McHugh Fire today, burning in Chugach State Park, just south of Anchorage. 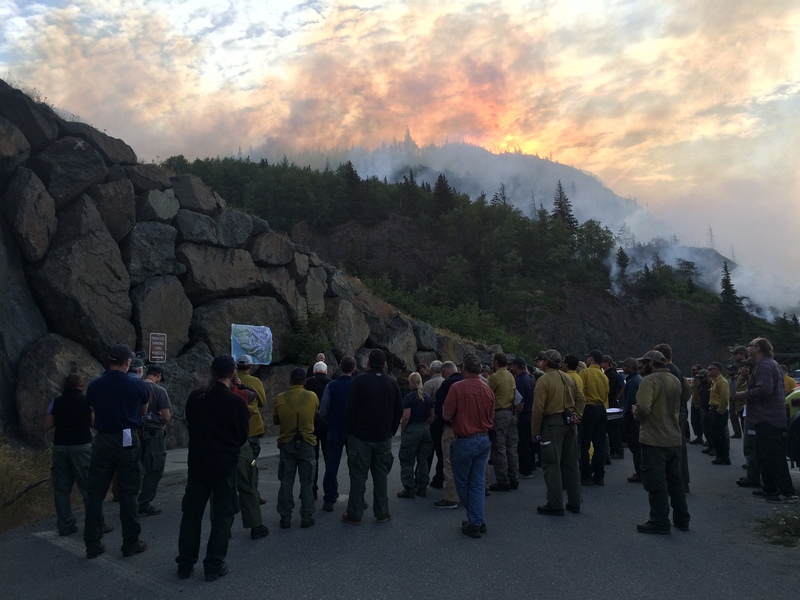 The Alaska Interagency Type 2 Incident Management team has assumed management of the fire. In addition, five hot shot crews from the Lower 48 are due to arrive in Alaska this afternoon to assist with the firefighting effort. The fire is currently estimated at 350 to 600 acres. Smoke in the area has made it difficult to accurately map the fire. Efforts are focused on protecting structures in the Rainbow Valley subdivision to the East of the fire and the Potter Valley subdivisions to the west. Crews are expected to complete laying hoses to protect structures in the Rainbow Valley area by this evening. Work to assess structures in the Potter Valley subdivision is continuing today. In addition, crews will be working to protect infrastructure along the Seward Highway corridor, including powerlines, the railroad and outbuildings. The north- and south-bound lanes of the Seward Highway have reopened, but motorists are urged to use caution in the area and expect delays if fire activity increases. The McHugh Fire began late Saturday. The cause is undetermined. Much of the effort to fight the flames is being done from the air, with National Guard Blackhawk helicopters and numerous agency aircraft scooping water from Turnagain Arm. A Temporary Flight Restriction is in effect over the fire. We urge all air traffic to avoid the area. A meeting to update residents on the firefighting efforts will be held this evening at 7 p.m. at South Anchorage High School. The Alaska Interagency Incident Management Team is grateful for the generosity of Alaskans who want to help, but is not seeking or accepting donations. Those wishing to help should consider a donation to the Wildland Firefighter Foundation, which helps the families of injured and fallen firefighters.